When you want to brighten up your living space but you don’t want to compromise on privacy or cosiness, opt for frosted glass. 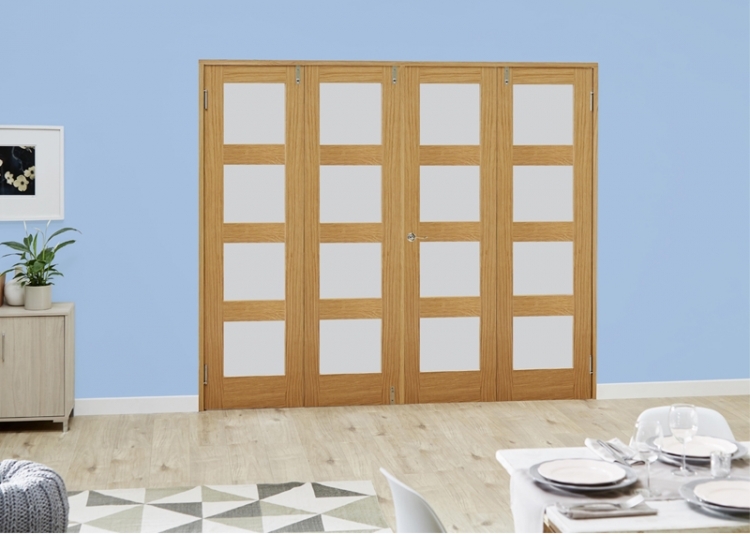 These oak 4 lite shaker design doors provide just what you need. Each door has 4 glazed panels which allow light flow but their opaque finish helps you to close off the space when needed. These simple and versatile oak internal French doors are sold unfinished. This is a popular option for those looking to match other items in their home. You can choose to select a natural stain or varnish to enhance the appearance of the oak or opt for a finish to match other items in your home. These doors MUST be decorated before installation, and we’d recommend a joiner is used for installation too. If the fit isn’t exact, these French doors can be adjusted in both height and width. The height can be reduced by up to 50mm, and the width can be reduced by 30-40mm. Set Includes: universal frame set, pivots, hinges, brushed stainless steel drop bolts and pre glazed doors. Choose your own handle and latch. Frenchfold design allows for both a central opening and folding ability. The oak Shaker frenchfold room divider range has an engineered core, ideal for thermal efficiency, strength, durability and value for money. Finish as you choose so you can match existing furniture, doors or windows. Made from oak, a popular choice for interiors. Frosted glazed panels allow light flow whilst maintaining privacy.